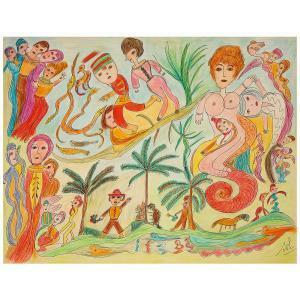 Find artworks, auction results, sale prices and pictures of Solange Lantier at auctions worldwide. 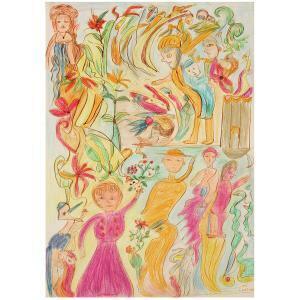 Solange Lantier dite "Sol" (1906-1987) Personnages, 1983 Coloured pencils and ink on paper; signed and dated lower right 16 9/16 x 11 13/16 in. 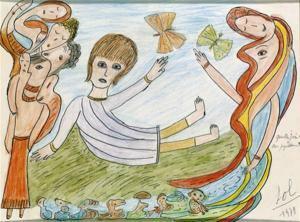 Solange Lantier dite "Sol" (1906-1987) Personnages Set of two drawings; pencils and ink on paper; signed lower right 14 15/16 x 10 5/8 and 16 1/2 x 11 13/16 in. 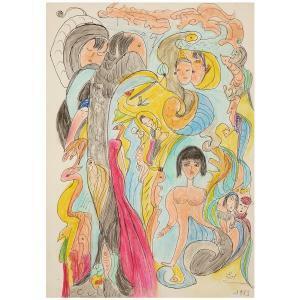 Solange Lantier dite "Sol" (1906-1987) Le jardin Pencils and inks on paper; signed lower right 19 11/16 x 25 9/16 in.